Solar panel costs have fallen off a cliff in recent years. The cost of solar panels today is about 100 times less than it was a few decades ago, and about half what it was just a handful of years ago. In many places, the cost of solar panels today is much less than the cost of electricity from your utility grid over the course of those panels’ lives. Part of this is thanks to major improvements in solar panel efficiency. Part of this is due to the cost drops that come when manufacturing increases. Part of this is due to governmental support for solar power across the world. However, aside from the all-in cost of a solar power system, several innovative companies have found ways to help you go solar without you having to pay for your solar power system up front. Solar leasing and similar models have sprung up and inspired a ton of people to go solar who wouldn’t go solar otherwise. Under a solar leasing model, you can often go solar for $0 or close to $0 down… and then save money on your electricity costs forever after. One study conducted last year by Harris Interactive® found that 97% of people didn’t realize they could go solar for such a small amount of money. 97% of respondents didn’t realize they could go solar for close to nothing (if not nothing). Luckily, you now know better. 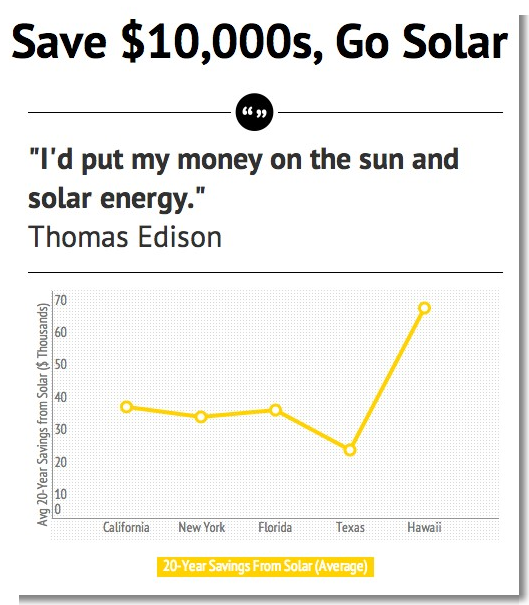 You now know that you can perhaps go solar without having to put thousands of dollars down. So, what are you going to do with that information?